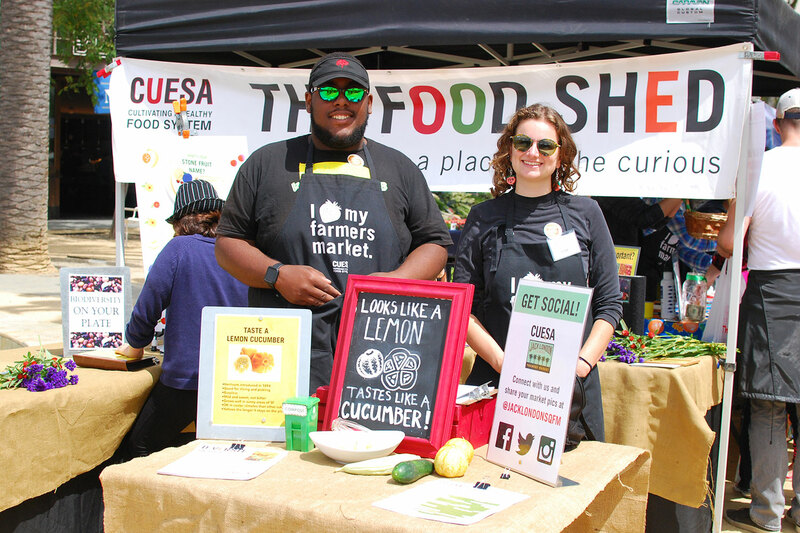 The Food Shed gives curious shoppers the opportunity to deepen their understanding of sustainable food systems. This education tent includes rotating interactive exhibits that focus on a theme (descriptions below). Each exhibit includes engaging activities for all ages. 30 to 40% of food in the US is wasted. Learn how you can be part of the solution. Play a culinary matching game, add artistic flair to a gallery of “ugly” fruits and veggies, find out how much we’re throwing away, and try some pickled watermelon rind to get inspired to waste less at home. How much water does it take to grow a tomato? Or a pound of beef? With California facing one of the most serious droughts on record, farmers and eaters are feeling the impact. Quench your thirst for knowledge about the drought, find out how many bathtubs of water it takes to grow your favorite foods, and learn how farmers are adapting to an increasingly dry climate. Honeybees do much more than just make honey. They play a critical role in our food system, pollinating a third of the crops we eat. Get to know our buzz-worthy friends and learn how we can help protect them through family-friendly games and activities. Pick up some California native pollinator seed mix, so you can nourish the bees in your neighborhood. “Pesticide Free,” “All Natural,” “Certified Organic,” “Biodynamic”—what do these terms mean, and which ones can you trust? Learn how to decode the confusing array of eco-labels you might find on your food through fun activities for adults and kids, and pick up our handy glossary of food terms. When you buy a head of lettuce, you may not think about the soil it grew in, but soil health is an ever-present concern for farmers. Dig deeper into the rich underground world of soil with a game to test your soil knowledge, a worm compost bin and kids’ activity, and soil samples from Ferry Plaza farms. As the industrial food system promotes monoculture and narrows the genetic foundation of our food crops, farmers markets explode with variety. The Ferry Plaza Farmers Market has more than 1,500 varieties of fruits and vegetables throughout the year. Our biodiversity exhibit celebrates the bounty with an animal breed family photo album, a food oddity “What Am I?” activity, a produce variety matching game, and more.